Liz began studying theology in her twenties, completing a Bachelor of Divinity with Honours through Murdoch University in Perth, Western Australia. Her Honours thesis was on the Isaac material in Genesis. She then went on to complete her Doctoral studies in Old Testament/Hebrew Bible, with her dissertation focussing on the book of Lamentations. After teaching for five years at the University of Notre Dame in Fremantle, WA, Liz moved to her current role as Lecturer in Biblical Studies with Uniting College. 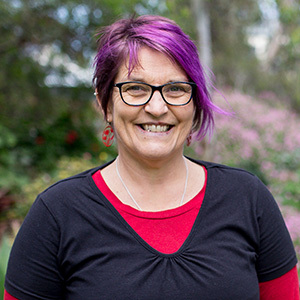 Liz currently has a number of roles in the college, including head if discipline for the theology programme of Flinders and Academic Dean (teaching & learning) for ACD, which includes being the undergraduate course coordinator. She has an interest in academic leadership and academic quality. Liz is an active researcher, and is currently co-chair of the Biblical Literature and the Hermeneutics of Trauma section in the Society of Biblical literature, and is on the steering committee for Writing/Reading Jeremiah section. She publishes regularly and is on the editorial board of the Journal of Biblical Literature. Boase, E.C. (2006). The fulfilment of doom? The dialogic interaction between the book of lamentations and the pre-exilic/early exilic prophetic literature. New York, USA: T and T Clark. Boase, E.C. (2016). Fragmented Voices: Collective Identity and Traumatization in Lamentations. In Elizabeth Boase and Christopher G Frechette, ed. Bible Through the Lens of Trauma. Atlanta, Georgia: SBL Press, pp. 49-66. Boase, E.C. and Frechette, C.G. (2016). Defining Trauma as a Useful Lens for Biblical Interpretation. In Elizabeth Boase and Christopher G Frechette, ed. Bible Through the Lens of Trauma. Atlanta, Georgia: SBL Press, pp. 1-23. Boase, E.C. and Agnew, S. (2016). “WHISPERED IN THE SOUND OF SILENCE”: TRAUMATISING THE BOOK OF JONAH. Bible and Critical Theory, 12(1) pp. 4-22. Boase, E.C. (2014). The Traumatised Body: Communal Trauma and Somatisation in Lamentations. In Eve-Marie Becker; Jan Dochhorn, Else Kragelund Holt, ed. Trauma and Traumatization in Individual and Collective Dimensions: Insights from Biblical Studies and Beyond. Gottingen: Vandenhoeck and Ruprecht, pp. 193-209. Boase, E.C. (2014). Grounded in the Body: A Bakhtinian Reading of Lamentations 2 from Another Perspective. Biblical Interpretation, 22(3) pp. 292-306. Boase, E.C. and Taylor, S. (2013). Public Lament. In MJ Bier & T Bulkeley, ed. Spiritual Complaint: The Theology and Practice of Lament. Eugene, USA: Pickwick Publishers, pp. 205-227. Boase, E.C. (2013). Blurring the Boundaries: The Rhetoric of Lament and Penitence in Isaiah 63:7-64:11. In MJ Bier & T Bulkeley, ed. Spiritual Complaint: The Theology and Practice of Lament. Eugene, USA: Pickwick Publishers, pp. 71-87. Boase, E.C. (2012). The Cursing Psalms: What are they, why are they there and how do we pray them today? New Norcia Studies, 20 pp. 59-65. Boase, E.C. (2008). The Characterisation of God in Lamentations. Australian Biblical Review, 56 pp. 32-44. Boase, E.C. (2008). To Imprecate or Not: Psalm 137 and its Appropriation in Music. Conversations, 2(3) pp. 1-6. Boase, E.C. (2008). Constructing Meaning in the Face of Suffering: Theodicy in Lamentations. Vetus Testamentum, 58(4-5) pp. 449-468. Boase, E.C. (2005). Many Voices of Lament: An exploration of the book of Lamentations. Australian Journal of Liturgy, 10(1) pp. 3-26. Boase, E.C. (2001). Life in the shadows: The Role and Function of Isaac in Genesis – Diachronic and Synchronic Readings. Vetus Testamentum, 51(3) pp. 312-335.